Greetings, young one. 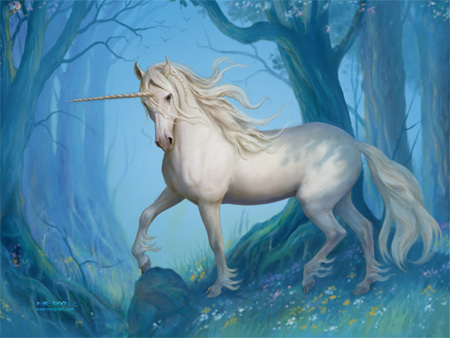 It is Starlight of the Unicorn race, and I greet you all with warmth and love from the fairy realm where we reside. In the misty meadows where tomorrows and yesterdays intertwine, there I am. Come with me, sit with us for awhile and become refreshed. For all is fresh and new here with ripe potential for astonishing creations. You humans need to realize the power of your intention. For your words, your thoughts – just as much as your actions – create. And they create even more quickly now with the rising tide of the energies that circle and encircle your planet, Gaia. The saying “Actions speak louder than words” is of the old way, the old thinking. 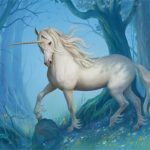 The new way of thinking shall “Be careful what you think, for there it is!” And we unicorns wish you to see and truly take this deep lesson of truth into your hearts, for when you embrace this fact, your world around you changes into whatever you wish it to be so. I am Starlight of the Unicorn race. We are many, yet we are few at the same time, for we have been hidden for so long, just out of reach from humanity’s control, tucked in the recesses of the dream of the collective. You all intrinsically know us, yet we have remained hidden, for you were not ready for our light, our purity, our power. For you were not yet ready to understand that these same attributes are within you, human child. It is true. And the child within you is growing now into that of a galactic human and your world, your bodies, your environment, your energy signatures are all gloriously rising into that of a brilliant white light. I am Starlight of the Unicorn race. We see you developing into more of what you already are but have forgotten. You are here to rediscover and re-remember. Isn’t that delightful? Ride with me in the misty fields and allow the cool breezes filled with the laughter of the sylphs to clean your lungs and fill you with delight. Talk with the fairies as they are so eager to become reacquainted with their human friends. Ride on my back. Feel the silky whiteness and purity of my mane and be lulled into a deep peace by the rhythmic galloping of my hooves. Meditation can be whatever you want it to be, can it not? Can you see this yet with your third eye? I touch my horn to your third eye. For it is time, high time, that you see this truth with your heart. You can be fully awake and functioning and loving your children – your foals, and joyful in your place of employment and yet carry that peace of meditation, of inner peace within you wherever you go at all times. Whether you gallop with me in the in between spaces of dimensions and find peace with the fairy folk, or sit in your favorite chair in your living room, or imagine yourself on your favorite star ship with your long lost (but found!) star families; think about whatever and wherever it is that brings you joy and go there. Focus on a beautiful setting and imagine yourself being there, so that even though you may not be able to afford the ticket to go, you are already there in your mind. For if this is a matrix you are living in, why not? Why not embrace the freedom in this malleability? For all is thought, and thought begets creation. And you are creators. Stretch. Open up to new possibilities for they are are all within, inside you. You are limitless in spirit and encased within the fragile confines of a human body. But this body, my children, is morphing, and your powers are coming online. Rejoice! I am Starlight of the Unicorn race and we rejoice with you, humanity, in your potential growth and self discovery. We touch our horns to you in friendly greeting and depart now into the light.